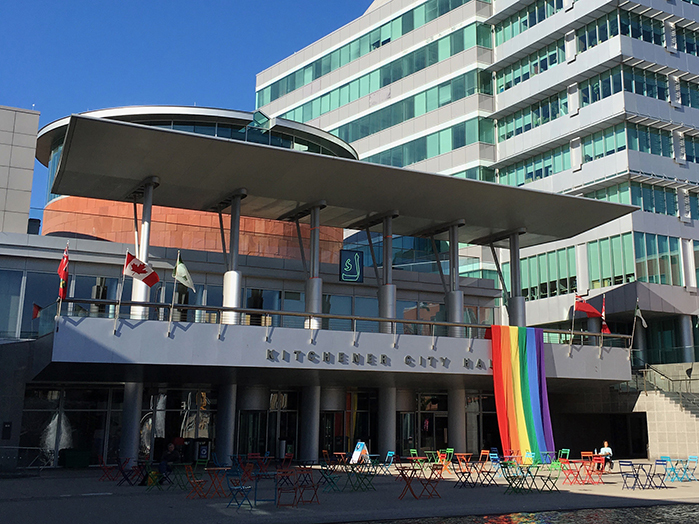 For CAFKA.16, Jamelie Hassan installed a neon green Arabic letter “ﻚ” [kaaf], the equivalent of the Latin letter “K”, above the porch of the Kitchener City Hall. “ﻚ” is the 22nd letter of the Arabic alphabet. It is the first letter of "Kitchener" when transliterated into Arabic, as well as being the first letter in “Canada” and “CAFKA”. The Arabic word “kaaf” translates directly as the “palm (of the hand)” and the Arabic letter has been used to symbolize the verb of creation. Kun (كن) is an Arabic word for the act of manifesting, existing or being. In the Qur'an, Allah commands the universe “to be” (kun! !كن), and “it is” (fayakūn فيكون). Letters not only represent sounds, they have histories and acquire associations over time. To non-Arabic speakers, Arabic letters are meaningless ciphers. At worst, they represent a foreign threat – at best, an expanding universe. To Arabic speakers, the presence of the “ﻚ” above the porch of the Kitchener City Hall may be at once disjunctive – out of place – yet deeply affecting: Of all the words ever tasted and felt that have started with this letter. Of the lived experience of those from other countries who for the first time became aware of a country, “Canada كندا”, that began with this letter. Of those who learned for the first time of a place starting with this letter “Kitchener كيتشنر” that would be their new home. For those, the sight of the “ﻚ” above the entrance to the city hall may have been a memorable moment as well. Since the 1970s, Jamelie Hassan's work has been influenced by cultural politics, social activism, and her background as a Canadian born to Arab parents. She has travelled extensively throughout North America, Mexico, Cuba, Europe, the Middle East, and Asia. She works as an artist, writer, curator, and lecturer. Her work is represented in major collections across Canada including the National Gallery of Canada, the Art Gallery of Ontario, the Glenbow Museum (Calgary), and the Morris and Helen Belkin Art Gallery in Vancouver. Hassan has received numerous awards for her work including the Governor General's Award in the Visual and Media Arts in 2001.